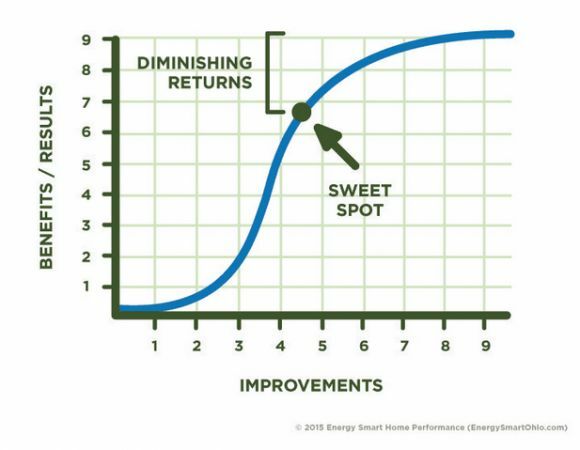 Nate Adams describes how to hit the sweet spot in residential efficiency to maximize savings. 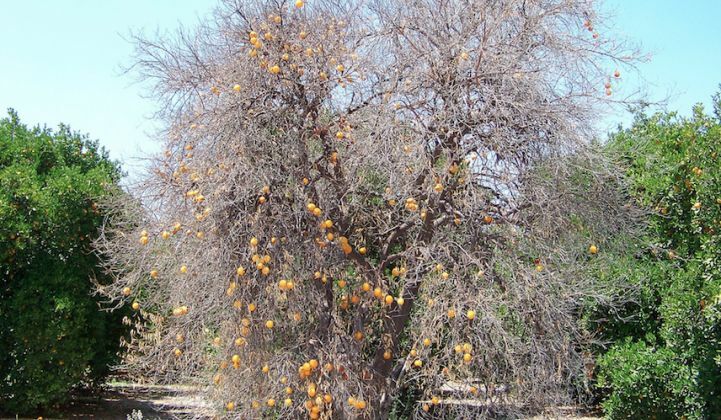 Most folks in the efficiency world are familiar with the concept of low-hanging fruit -- do a few small things, and big results will happen. 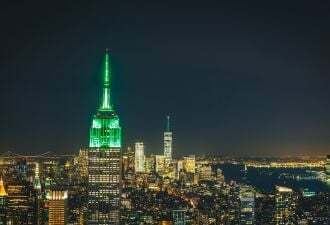 The trouble is, we’ve found precisely the opposite to be true, and now we’ve not only come up with a way to express it, but have also identified two anecdotes that suggest our hypothesis might be accurate. 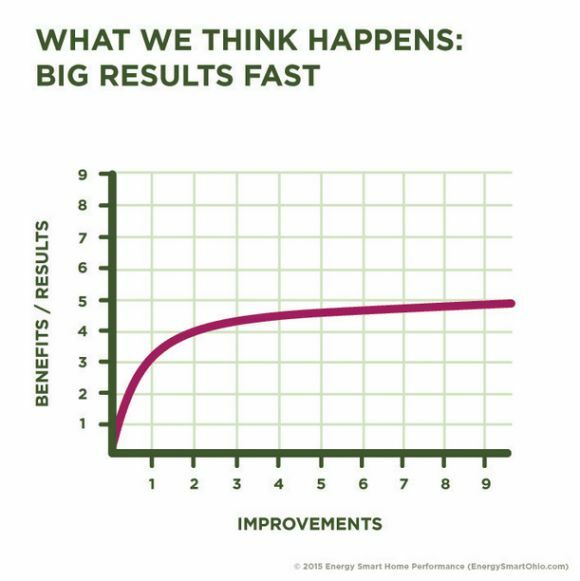 The few firms and organizations in the home performance/energy efficiency world that have actually tracked results have found energy-savings results to be almost ridiculously scattered. There is essentially no rhyme or reason to which projects work and which ones don’t. But we believe we may have cracked the code. 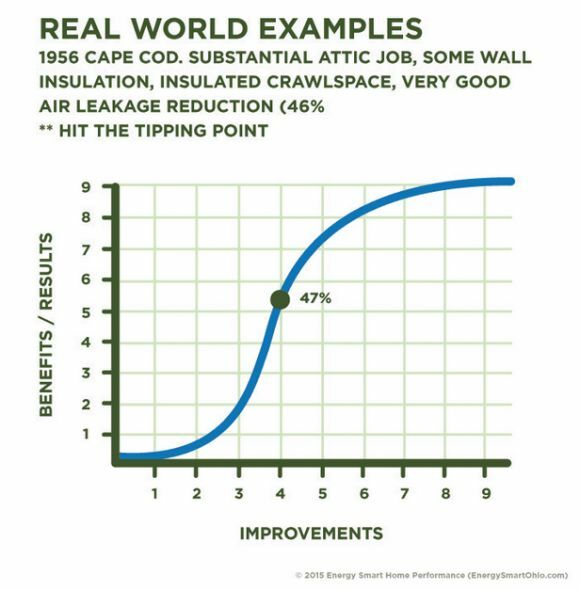 If you are a homeowner, you likely don’t even care about energy efficiency (EE), if you get right down to the core issues at stake. More than likely, you are trying to solve a real problem: a child’s room that is too hot or cold; a second floor that won’t heat or cool; indoor air quality problems causing asthma, allergy, and other health issues; icicles in colder climates, and more. If you’re smart, you severely discount any promises that are made to you about savings. Studies have shown that homeowners expect only 25 percent of what is promised to actually come to pass. That’s often about right. But it doesn’t have to be the case. If a project goes far enough to bring the system of systems that is a building into balance, amazing things can happen. Stop short and failure is guaranteed. 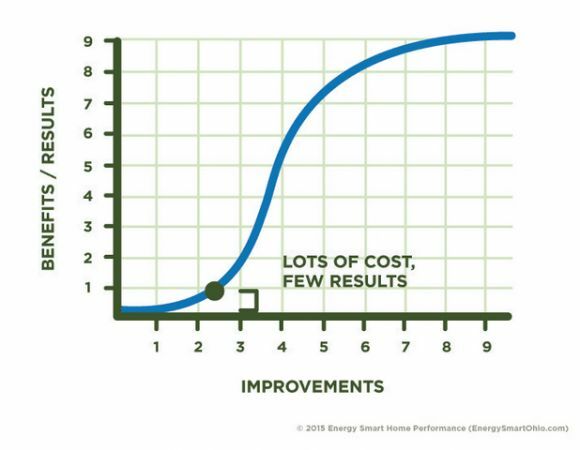 Go far enough, and homes become very comfortable, far healthier and safer, longer lasting, and more efficient. Those are the four tenets of home performance. Everything shows up at the same time when you reach a balance or tipping point. Enough yapping. Let’s look at some pictures that are hopefully worth a thousand words. According to the low-hanging fruit theory, if you pick the right two upgrades, you’ll get four results. After that, however, benefits taper off fast. The above chart depicts what usually actually happens. Those two improvements deliver more like .5 results. Good things are possible, but you can’t mess around -- you have to commit. Just like when deciding to lose weight, if you don’t have a plan to both exercise and eat differently, the odds of failure are high. 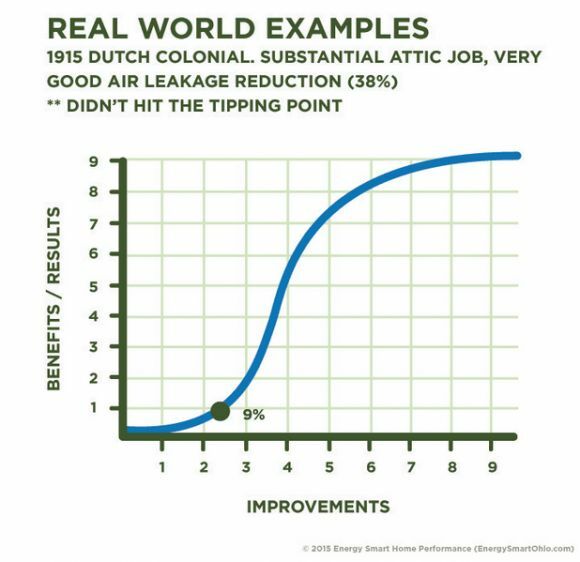 The chart above shows why residential energy efficiency and home performance haven’t taken off yet. Disappointment reigns supreme. Big results are promised, but don’t show up. Everyone in our field is considered a charlatan -- just another group trying to take homeowner money. 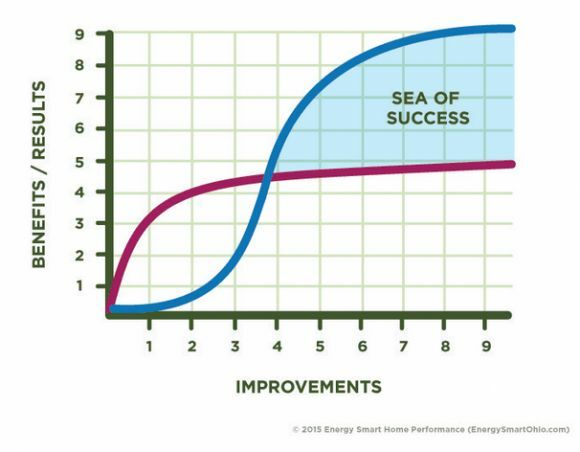 The "sea of success" is where good things really start to happen. Homes become supremely comfortable. Indoor air quality improves drastically, which affects both the health and safety of the home. Moisture problems are reduced, extending the life of the structure. And real efficiency gains begin to show up. Take a look at the above chart. Say this is a $3,000 attic air sealing and insulation job. The results are mediocre. The house may be a little more comfortable, but the energy savings are disappointing. Some rooms may be substantially less comfortable because the furnace runs less and rooms at the end of the duct runs don’t heat or cool well. We wrote about this in April 2014 describing a client whose family room is now colder than it was before the work was done. It's a side effect of not thinking of the home as a system of systems. Fix one thing and you may cause another problem. Imagine taking a few more steps, perhaps replacing an oversized furnace, sealing up the house a bit more, or carrying out some other improvement. The results that come from that, if a tipping point is reached, can be spectacular, as we recently found in one home and will touch on shortly. 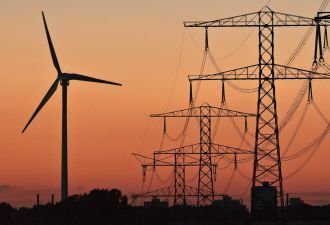 Other pros in the industry, such as Mike MacFarland of Energy Docs, have also found the same thing. Determining which extra steps will make the difference requires taking a very thorough look through the home, not to mention planning. 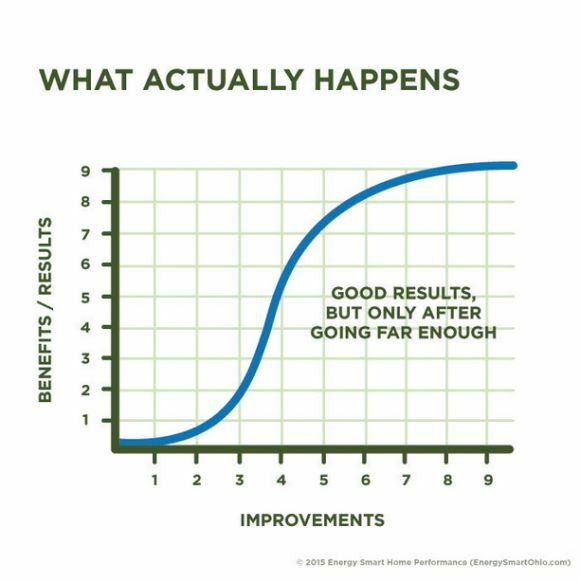 As you get deeper into improvements, at some point you reach a point of diminishing returns. The best place to be is right at that inflection point. 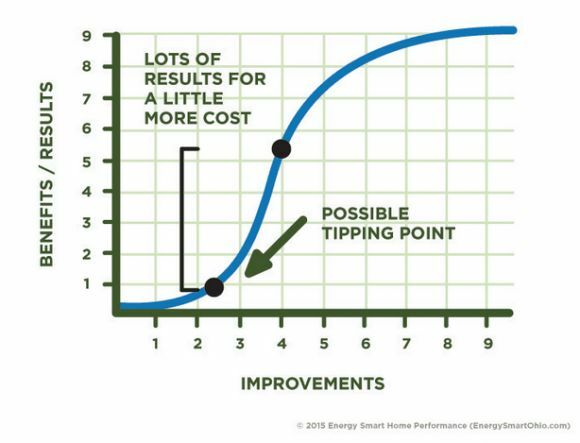 Energy Smart Home Performance comes up with three plans as part of our comprehensive planning process, which aims to capitalize on different parts of this curve (called a sigmoid curve). The top plan, which we call "complete," is soup to nuts. Everything that might affect the problems we’re called out for -- those rooms that don’t heat or cool, indoor air quality problems, icicles and so forth. 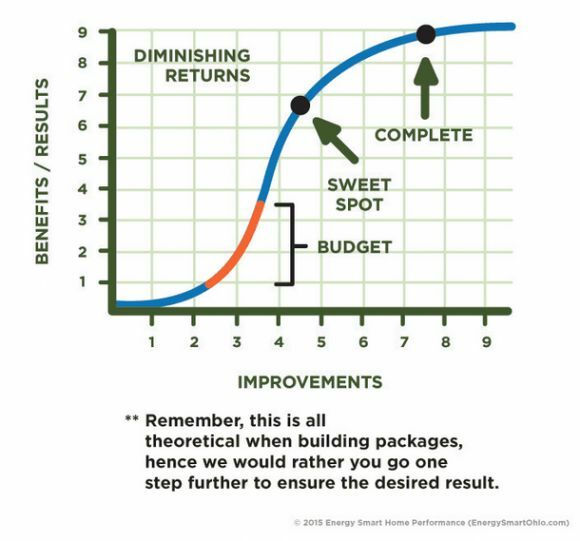 The second plan is a sweet spot that identifies which upgrades are most likely to solve problems. 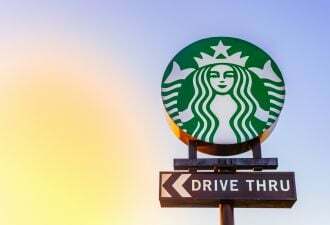 It aims for that inflection point where diminishing returns begin. The third plan -- budget -- is tailored to a budget and a prioritized list of problems we develop. Depending on how big of a budget a homeowner has, it may solve all of the problems, it may only solve one or two, or we may tell you the budget isn’t high enough and expectations need to be adjusted. The following chart represents a project we did in spring of 2013. It was done to chase a $1,250 rebate from the local gas company, Dominion East Ohio. The objectives were a bit fuzzy -- more comfort and hopefully some energy savings. The project saved 9 percent. That’s a fail. The above chart shows a recent project undertaken with our new process, for which the homeowner selected the budget plan. It was enough to hit the tipping point. This home is now kept at 73 degrees instead of 69. The 69 was downright cold in some parts of the house. Now the whole home is far more comfortable -- and the energy bills were cut nearly in half. Does this house need more? Maybe. It holds moisture well enough now that it needs supplemental dehumidification. Beyond that, it’s up to the homeowner, but keep in mind that these results came from executing the lowest-cost option. As you can see, good results were achieved, and not by chasing low-hanging fruit or rebates. 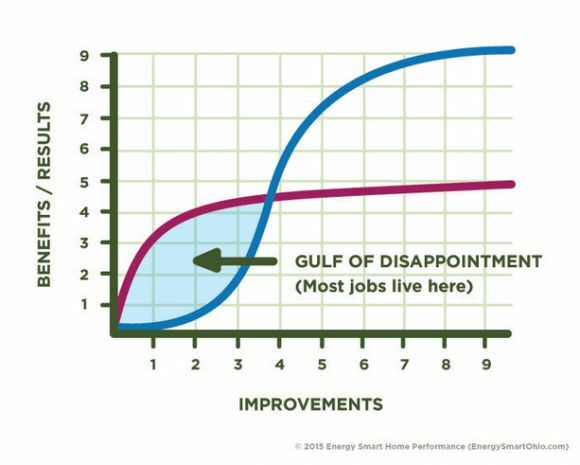 Nate Adams, founder of Energy Smart Home Performance, is an author and building-science geek. He has nine years of experience in the business. He relishes figuring out how to solve complex problems. This piece was originally published on his blog and was republished with permission.